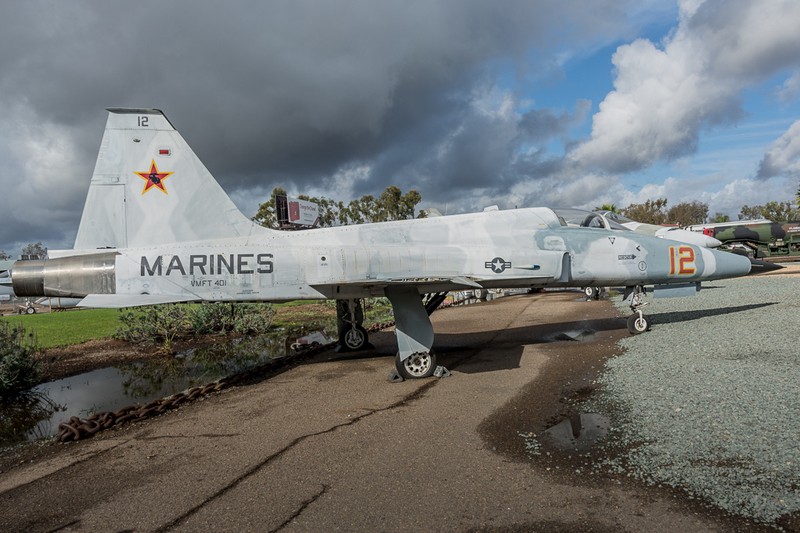 Located approximately ten miles north of San Diego, California, on the grounds of Marine Corps Air Station Miramar (MCAS Miramar), the Flying Leatherneck Aviation Museum proudly displays aircraft, artifacts, documents, and memorabilia that are representative of United States Marine Corps history. 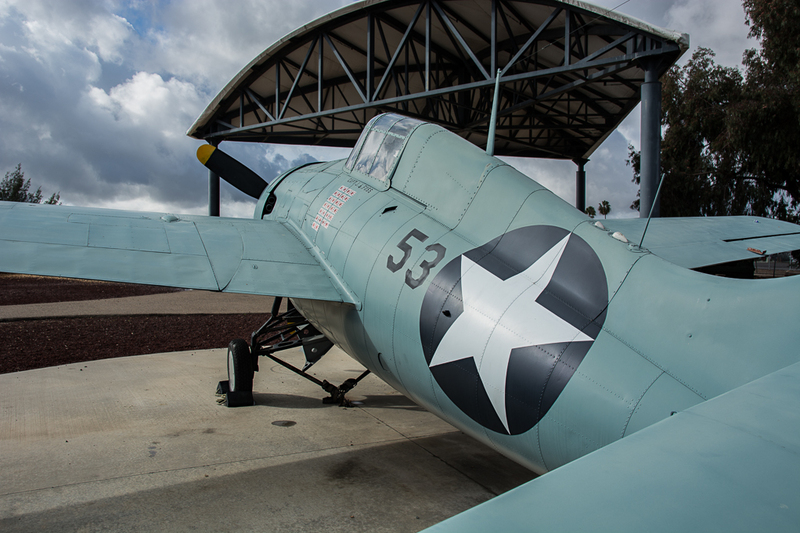 Even though the museum is located on MCAS Miramar, there is open access via a public entrance. 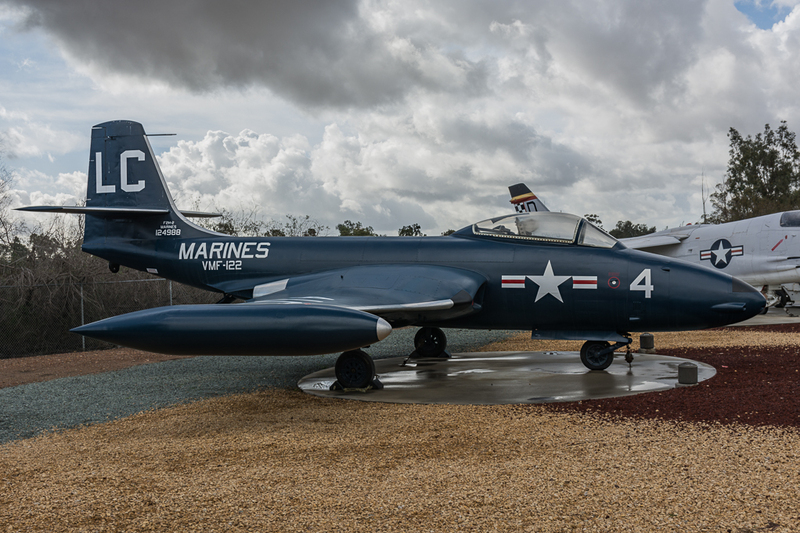 Once inside the museum grounds, there are over 38 aircraft on display (with over 50 in their total collection) representing several eras in USMC aviation history. 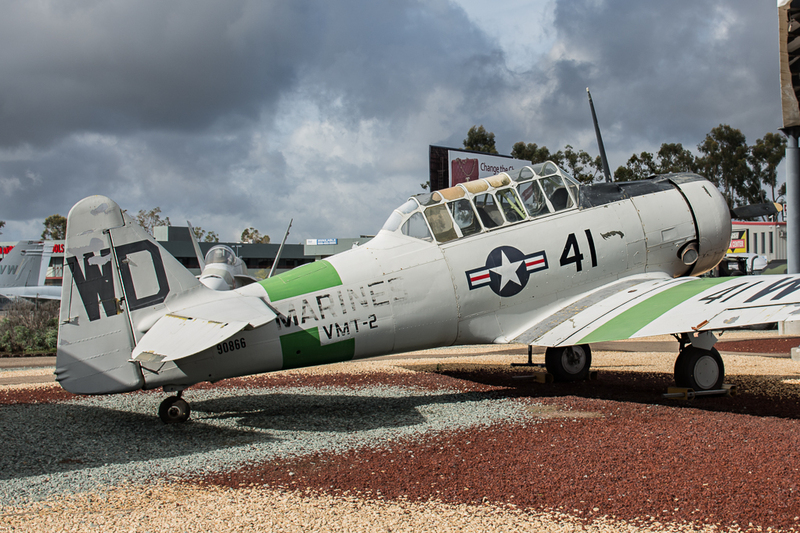 Beginning with World War II, and continuing until the present day, there is plenty of history to absorb during a visit to the museum. 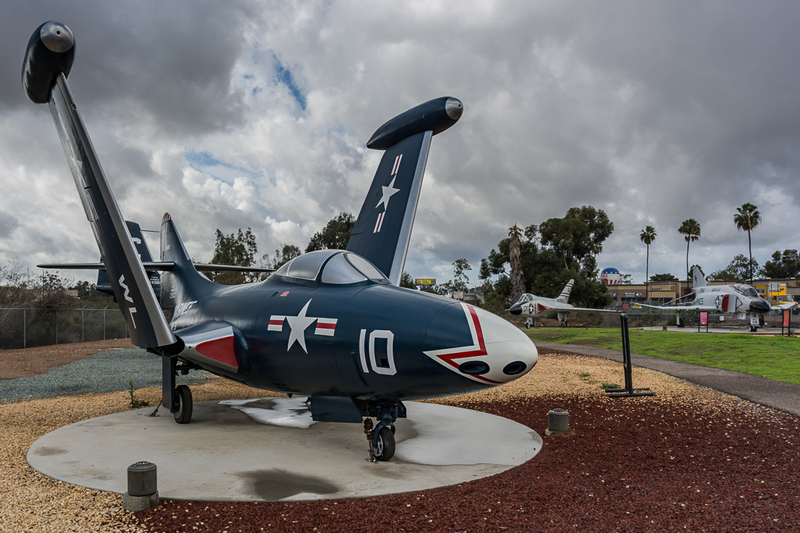 A complete list of the aircraft on-display at the museum is located HERE. 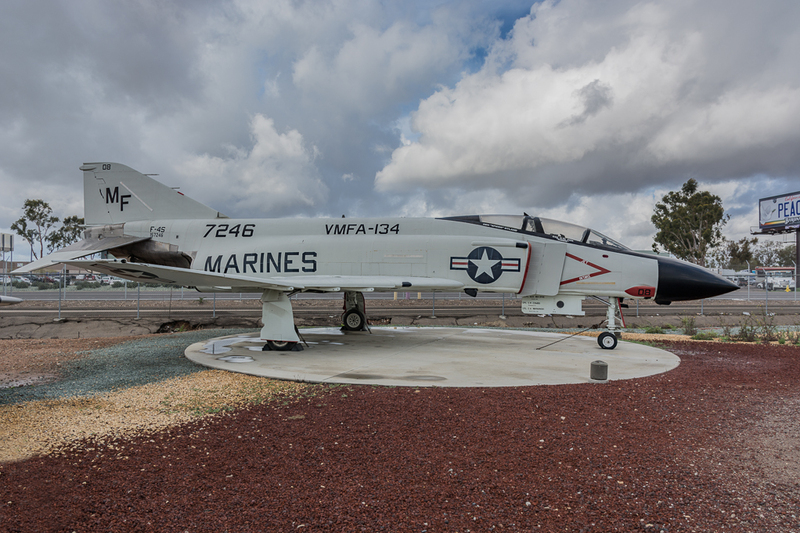 The Flying Leatherneck Aviation Museum is the only museum in the world dedicated solely to USMC aviation. 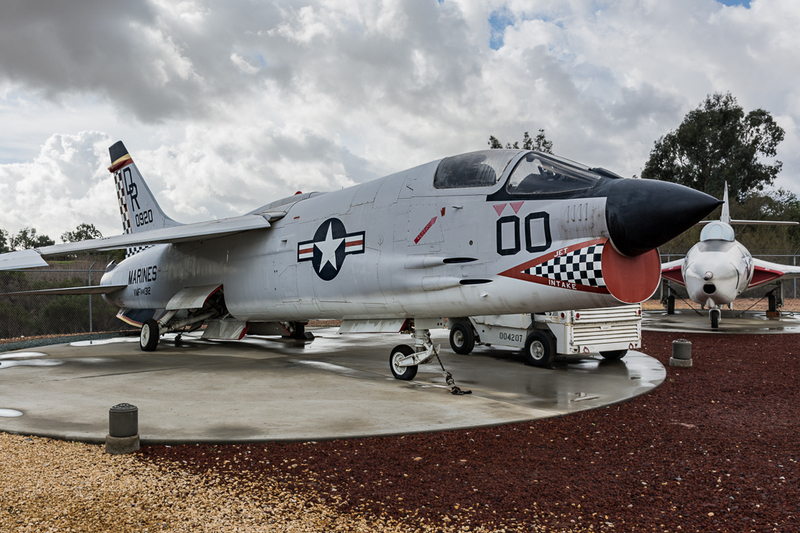 Upon arriving at the museum, one cannot help but notice several Douglas A-4 Skyhawks on display in the yard across from the parking area. 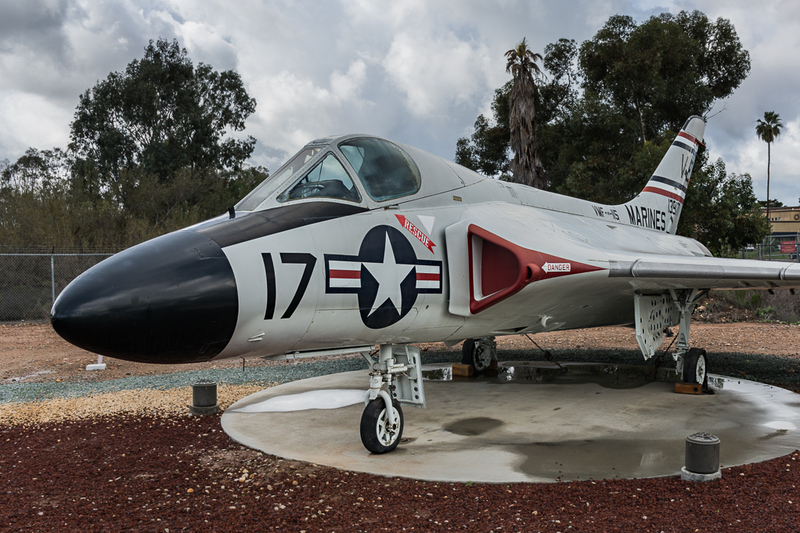 One specimen, a Douglas A-4M Skyhawk II (BuNo 160264) was the last A-4 manufactured. 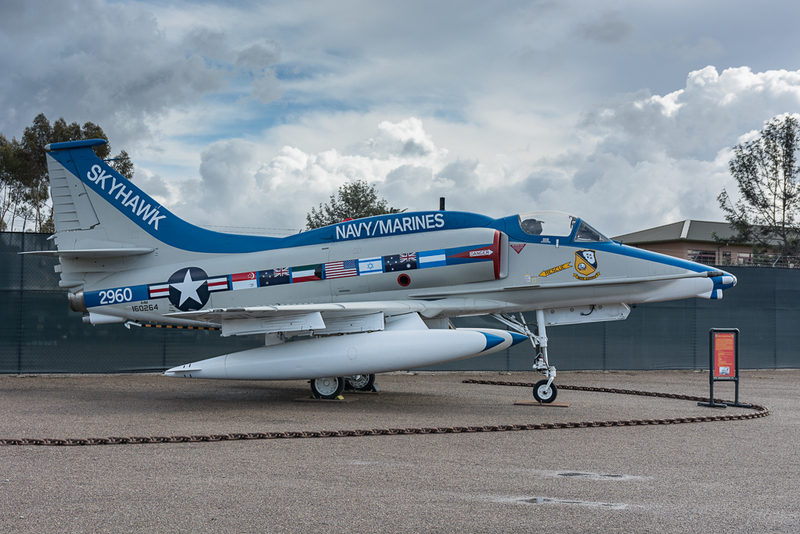 Painted in a special scheme, with flags representing all the countries who flew the beloved Skyhawk, this aircraft is a must visit/photograph specimen. 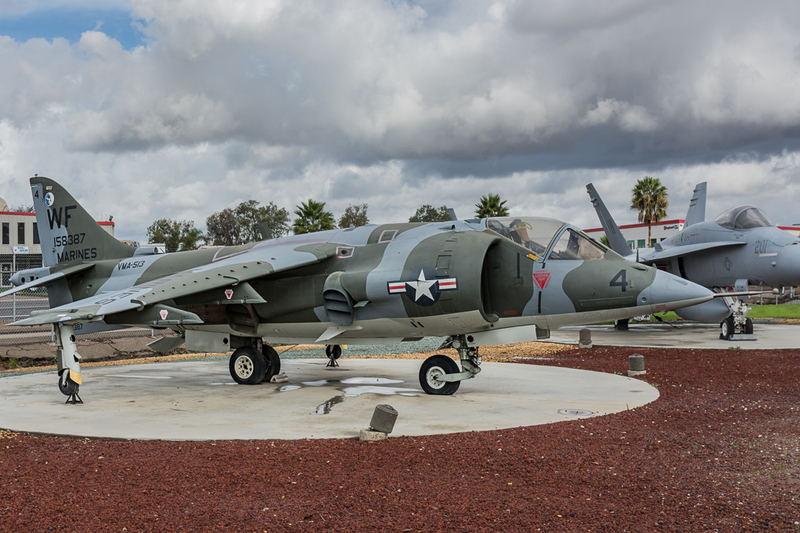 Also in this same area, is a Grumman A-6E Intruder and a Grumman EA-6B Prowler from Electronic Attack Squadron 131 (VAQ-131), which was added to the museum’s collection in February of 2014 (now in VMAQ-3 markings). 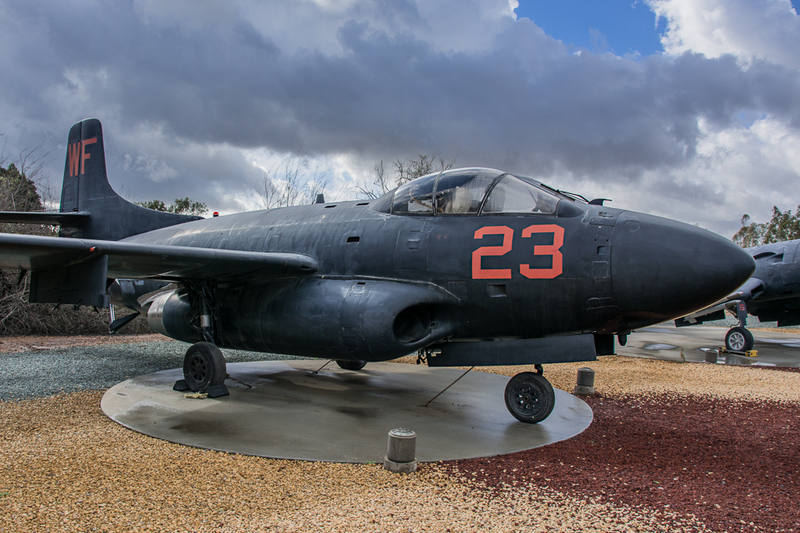 Another interesting aircraft in this area is a Vought (LTV) RF-8G “Photo Gator”. 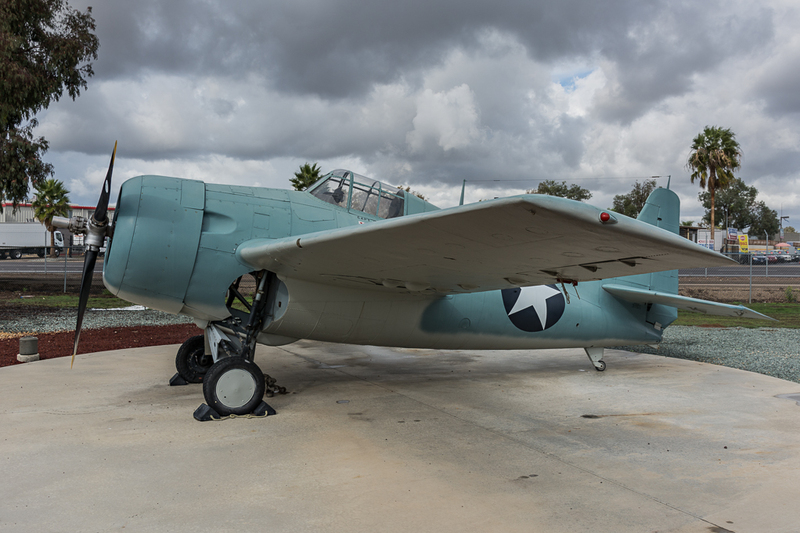 The Photo Gator was one of the most successful reconnaissance aircraft in the history of the USMC. 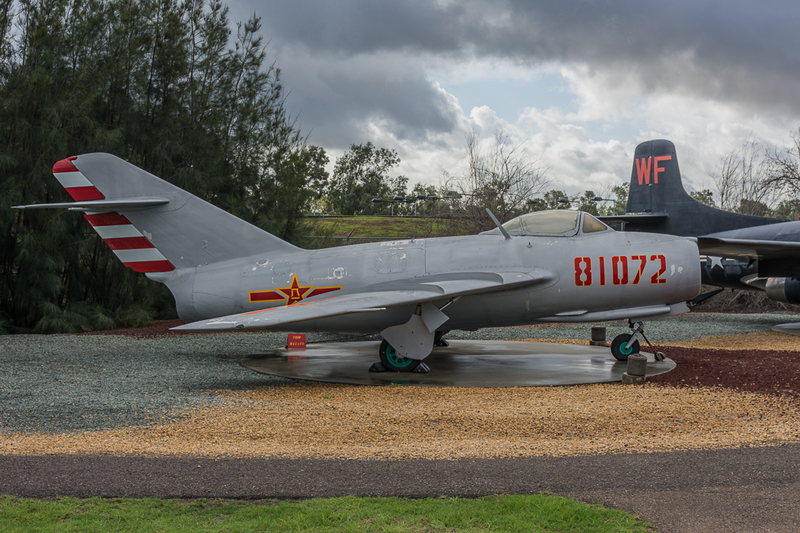 These aircraft have flown many successful reconnaissance missions over Cuba and Vietnam. 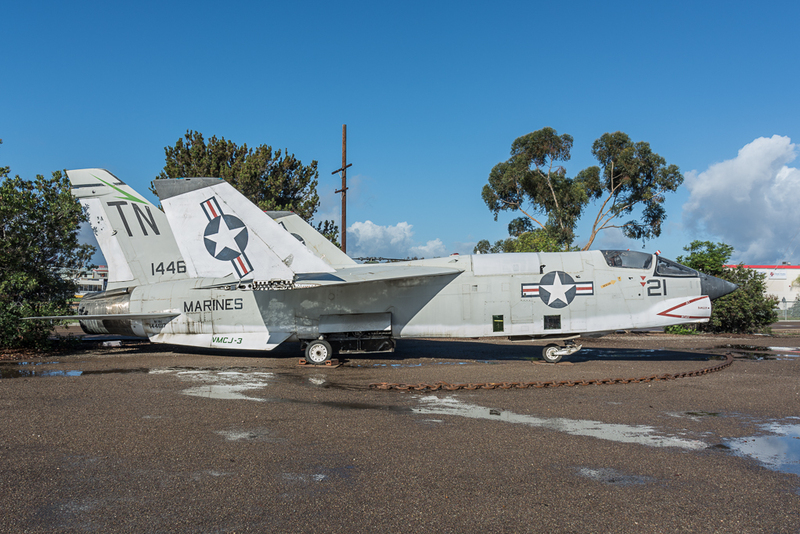 This aircraft is one of six on display worldwide and one of two in the Flying Leatherneck Aviation Museum collection. Also in this area is a Bell 214ST Super Transport. 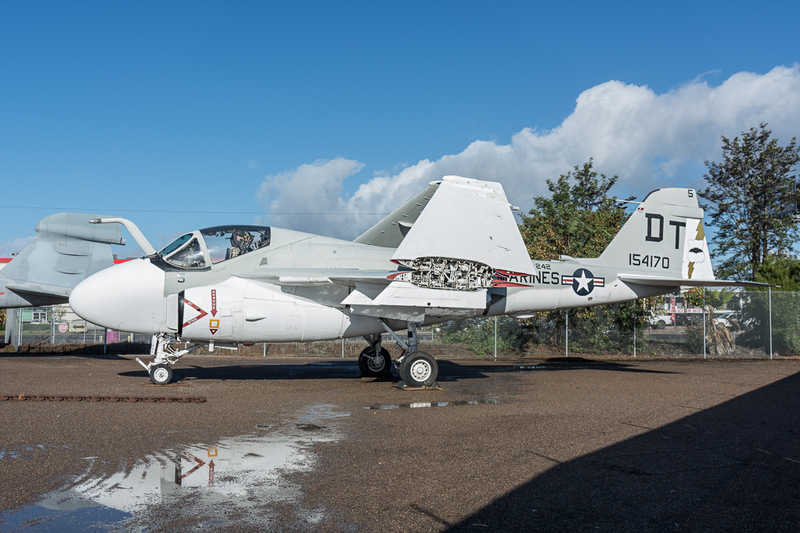 This aircraft is currently in Iraq Air Force Markings. 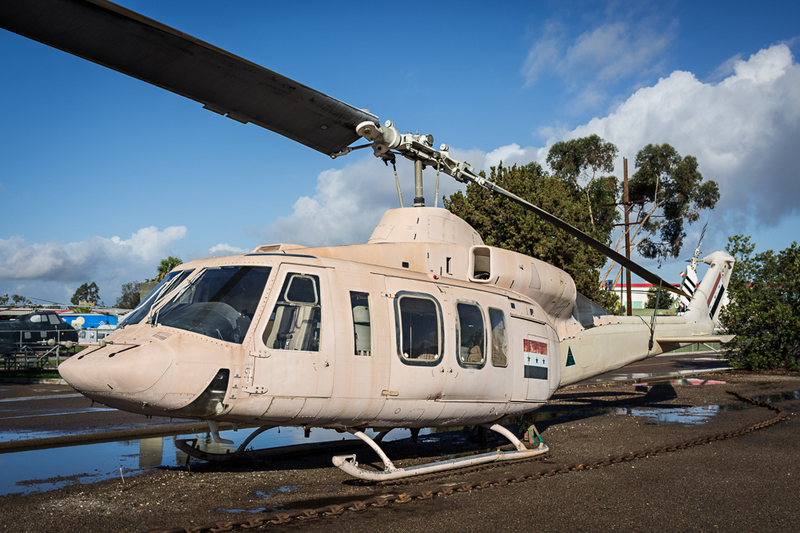 This super-sized Huey was originally designated for Iran, but after the fall of the Shah during the Iranian Revolution of 1979, the aircraft was sold to Iraq (who were allies of the U.S. during the Iran–Iraq War). 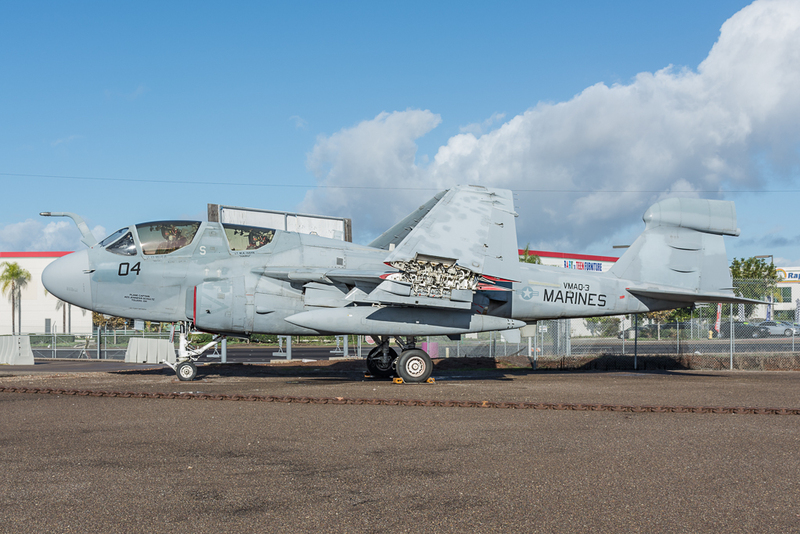 Once inside the museum’s main building, one can see artifacts, documents, and memorabilia that are representative of United States Marine Corps history. Here is where we met several members of the museum’s staff and were given a choice between a guided or self-guided tour. We elected for the guided tour and we were not disappointed. Our museum tour guide, or “Docent” as they are referred to, was Lieutenant Colonel Jack Cooper, U.S. Army, Retired. 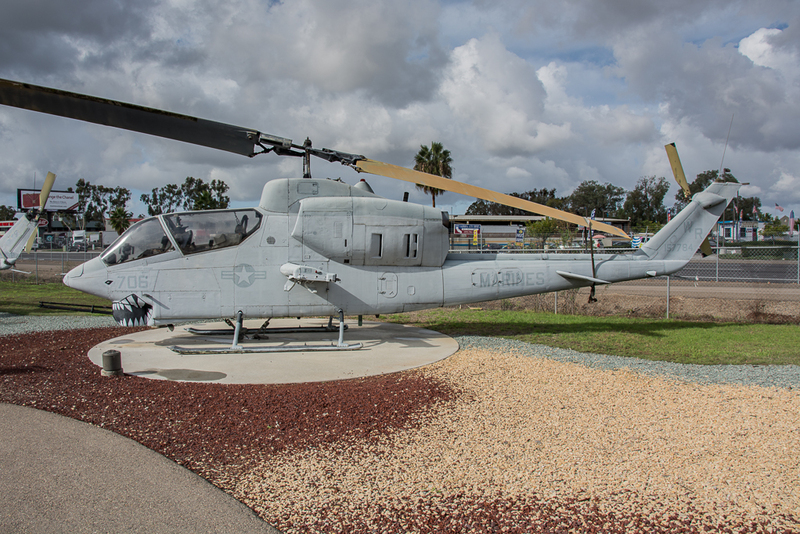 Lt. Col. Cooper is a former Bell AH-1 Cobra pilot who knew his history and aircraft very well. 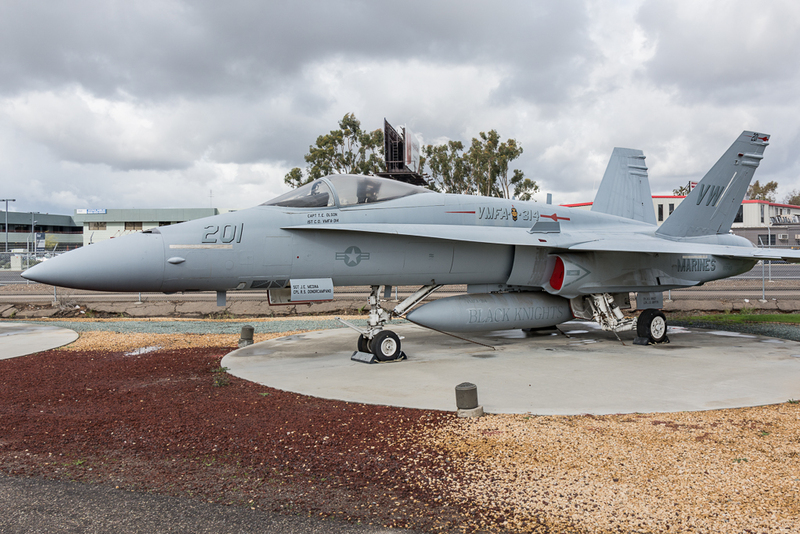 After a brief walkthrough of the memorabilia and artifacts associated with the major war the U.S was part of, we were taken outside to the main display area. 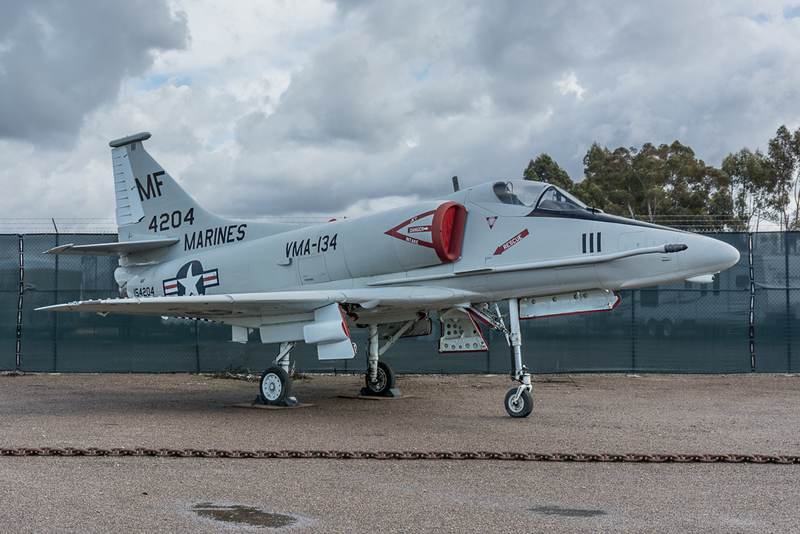 Outside we were treated to a wonderful display of USMC aviation history. 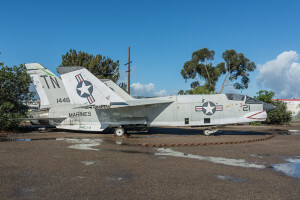 From early USMC aircraft such as the General Motors (Grumman) FM-2 Wildcat and General Motors (Grumman) TBM-3E Avenger, to more present-day aircraft such as the McDonnell Douglas F/A-18 Hornet, the history of USMC aircraft was well represented. 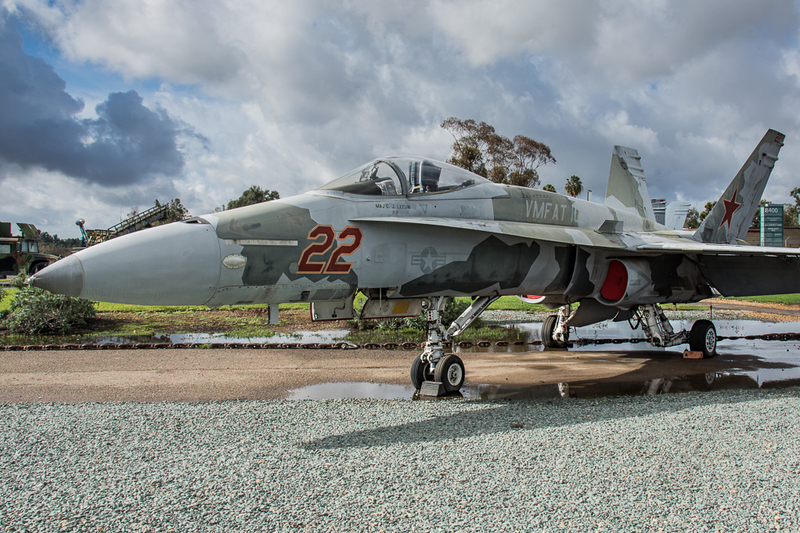 Some of the aircraft on display were unique variants not seen elsewhere. 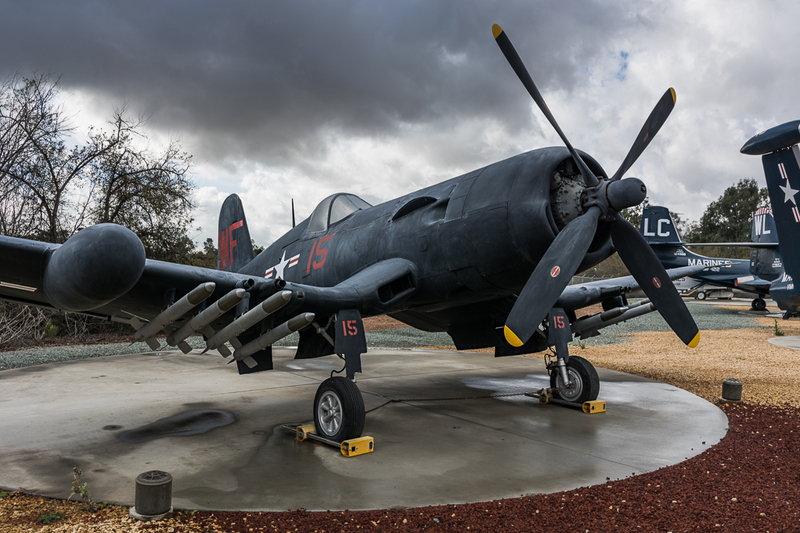 For example, a Chance-Vought F4U-5N Corsair and a Douglas F3D-2N (F3D-2T2/TF-10B) Skyknight were both night fighter variants used by VMF(N)-513 for night operations. 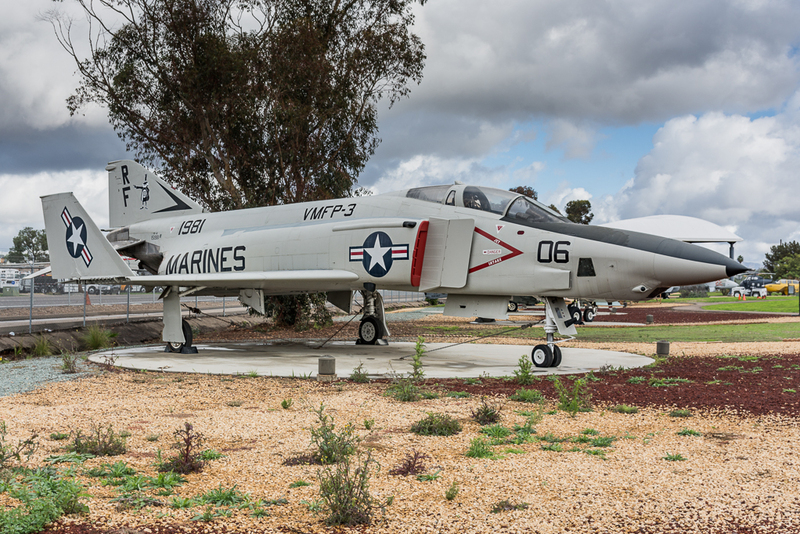 Also, several aerial reconnaissance variants of historic aircraft were on display including a McDonnell Douglas RF-4B Phantom II and a Grumman F9F-8P “Photo Cougar”. 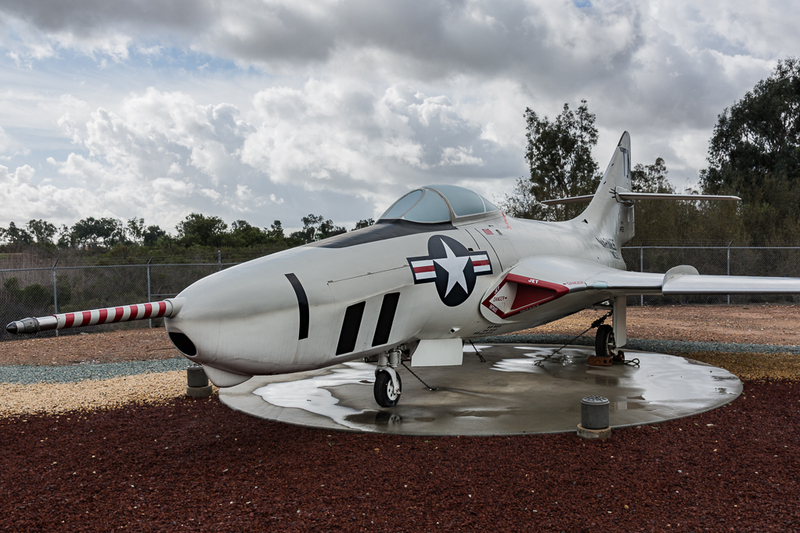 One Non-U.S. aircraft was on display, this was a Mikoyan-Gurevich MiG-15 which represented a formidable opponent of the U.S. in aviation history. 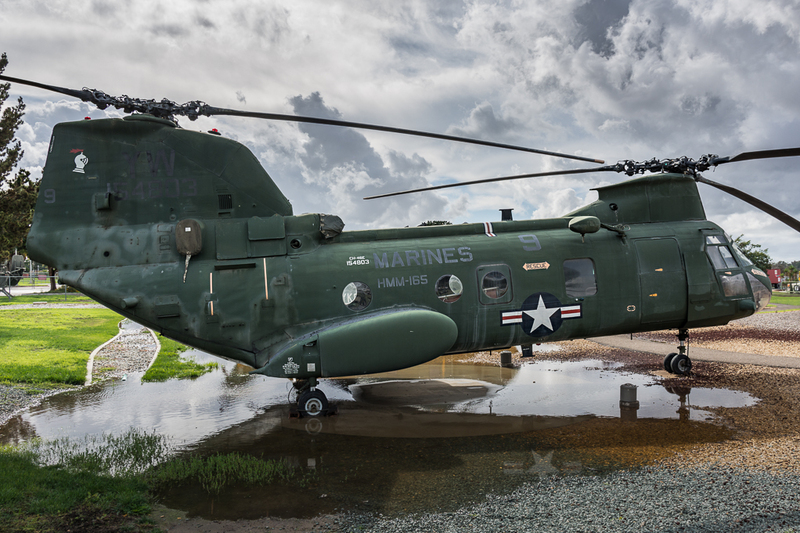 USMC aviation would not be complete without examples of the various rotorcraft that have been used by the USMC throughout their history. 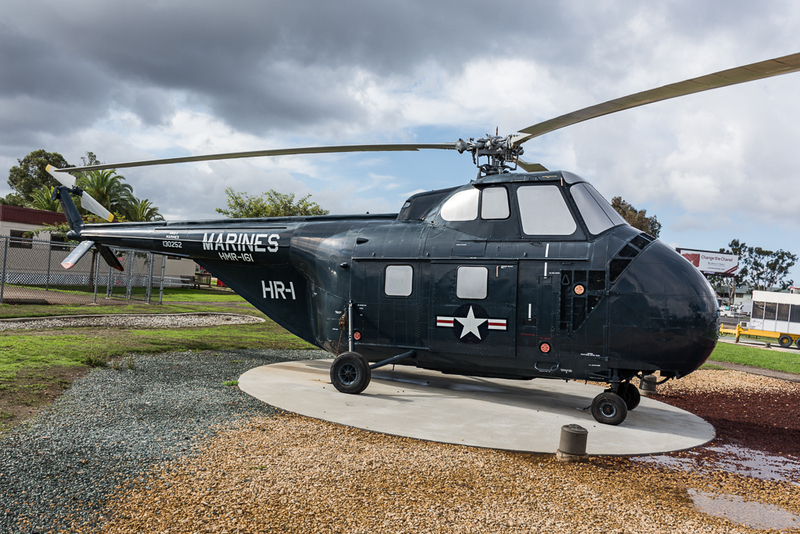 Including the venerable Bell UH-1N Huey and the Bell AH-1J SeaCobra, the collection contained specimens such as the Sikorsky CH-53A Sea Stallion, Sikorsky HRS-3 (H-19) Chickasaw, and a Sikorsky HUS/UH-34D Seahorse. 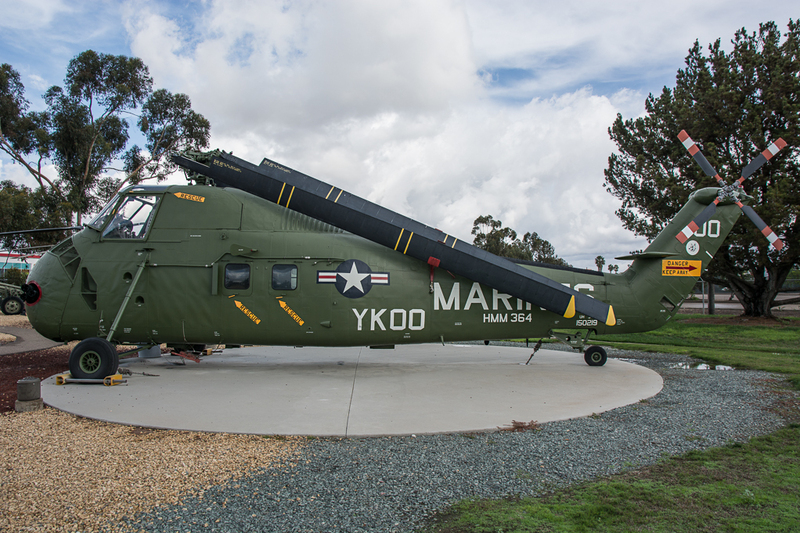 No USMC rotorcraft collection is complete without the Boeing-Vertol CH-46E Sea Knight and the one on display at the Flying Leatherneck Aviation Museum has plenty of history behind it. “Lady Ace 09” evacuated U.S. Ambassador Graham Martin from the U.S. Embassy in Saigon, prior to the Fall of Saigon at the end of the Vietnam War. 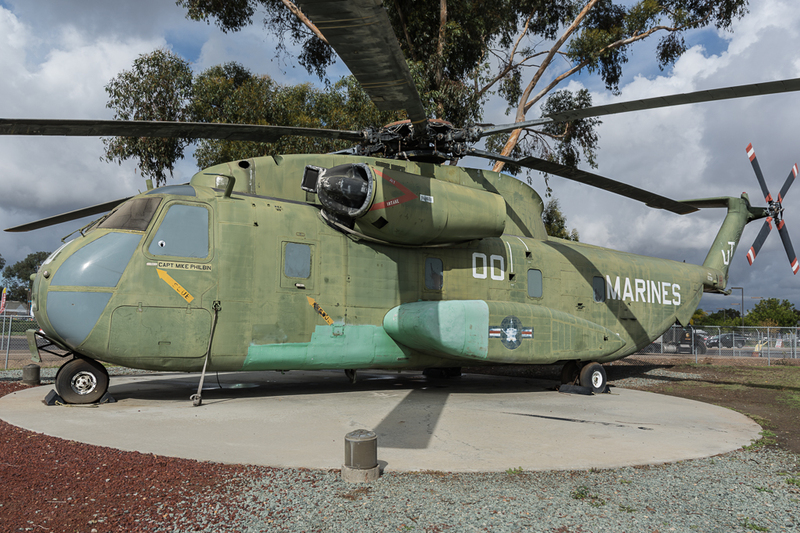 Riddled with multiple patches covering the numerous bullet holes throughout the body, this CH-46 (BuNo 154803) flew one of the last missions of the Vietnam War. 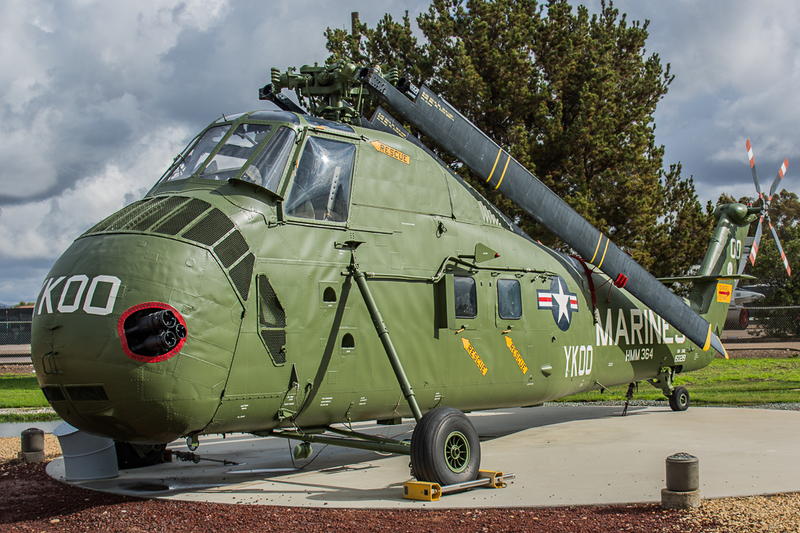 The Flying Leatherneck Aviation Museum is supported by The Flying Leatherneck Historical Foundation. Largely dependent on public donations, the museum does not charge an admission fee. With a collection jar for donations and a nice little gift shop, there are several ways one can “give back” for a great experience at the museum. 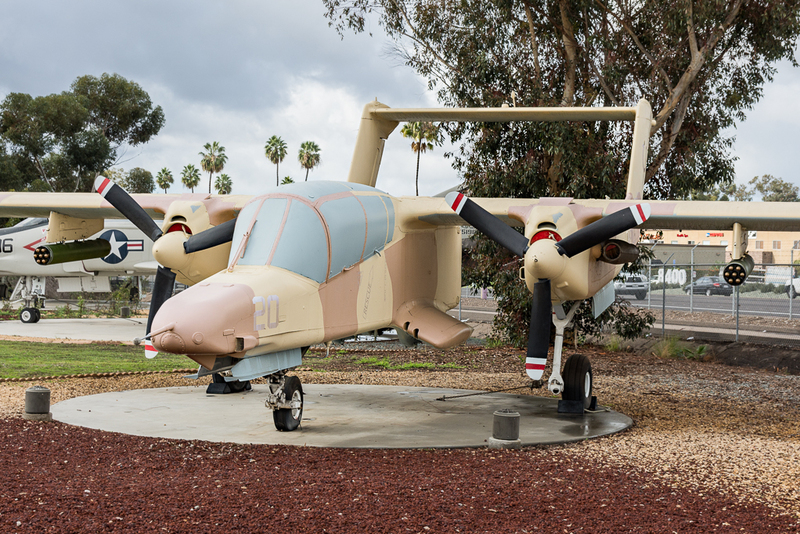 One of the unique aspects of the gift shop is, because it is part of MCAS Miramar, the gift shop sells squadron patches for the squadrons based at Miramar along with the squadrons of the 3rd Marine Air Wing. For those who collect squadron patches, it’s a great way to obtain patches for the west coast USMC squadrons without getting on-base or waiting for an airshow. Many of the Docents and other museum support staff kindly volunteer their time to the museum to keep the operation running smoothly. Most of these volunteers are ex-military personnel that have plenty of stories of their own to tell. For those who have depended on the mass media for information may be surprised when they hear the facts from those that served and fought for our country. 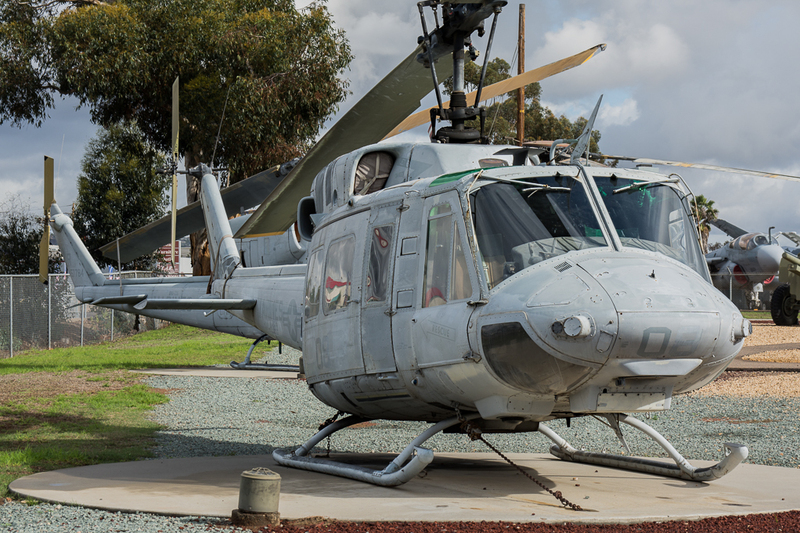 The Flying Leatherneck Aviation Museum is open Tuesday through Sunday 9 AM until 3:30 PM. There are several special events hosted by the museum during the course of the year. For example, the museum has several “open cockpit” days where visitors will have an opportunity to sit in the cockpit of selected aircraft. 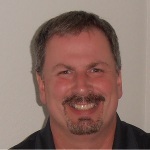 These events are a great opportunity to make the museum experience more interactive. 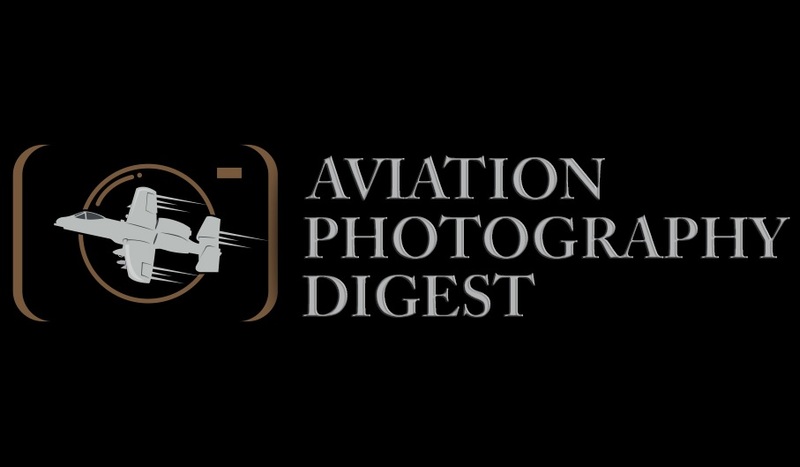 Aviation Photography Digest would like to thank Lieutenant Colonel Jack Cooper, U.S. Army, Retired and his colleagues for their wonderful hospitality. Lt. Col. Cooper gave us a wonderful tour filled with history and stories about the specific aircraft that were on display.